F is for the Flash. Ah, the Flash. This is a hero I've always enjoyed, a super-speedster with quick wits and a great super-suit. My first introduction to the character was the 1990s CBS show (yes, the one that featured Mark Hamill as a guest star villain). Subsequent Flash adventures included stints on the Justice League cartoon as well as Batman: Brave and the Bold. I also liked the incarnation of the character in the DC Justice League: New Frontier movie. Super-speed is one of my favorite superpowers, and I'd be a complete lunatic if I tried to claim that the Flash didn't serve as an influence for my hero, Crimsonstreak. I wrote a fast-talking superhero who wears red. 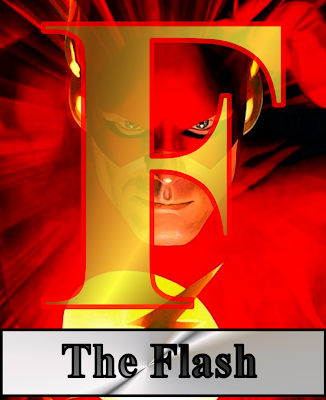 In my book, Crimsonstreak's the fastest being ever to exist. Even the character's name can be seen as a nod to the Flash's secondary moniker (the Scarlet Speedster). The characters have completely different backgrounds, but I definitely leaned on the Flash as an archetype for my character.